Ahhh, so sometimes I DO keep track of who posts what. Sometimes when it is a picture or a meme I take a picture of it on my iPad or my iPhone. That way I can go back and give credit to who posted and supply any other details. I didn’t think I would be posting that Nia video that I used in my last post, so I didn’t think to document who originally posted it to Facebook. Tonight I was looking through my pictures trying to find some inspiration for a post. I found a picture with a quote that touched my heart when I read it . . . .that is why I took a picture of it. My friend Michelle Casey had liked it or commented on it or something that caused it to show on my newsfeed under her name. When I read it again just now I wanted to post it so I looked more closely to see who it was from. I Googled the name in the watermark. All that came up was a Facebook page. I went to the “About” page of that Facebook page, it disclosed that nothing posted on that Facebook page was from the owner of the page. She just found things on the internet and posted them on her page. She said IF she knew who they were from she gave credit. But every picture on her Facebook page had HER information. And since it took me about 60 seconds to find the actual person who said the quote she posted on her page, I think that perhaps she doesn’t actually TRY to find the original author of the things she posts . . . but whatever . . . that is part what the internet has created. Even me, I am going to use someone else’s words as a post on my blog because they spoke to me when I first saw them. They are wonderful and I knew that I would want to come back to them and probably need to know who said them so I saved the picture to my device. They spoke to me now when I re-read them. They are the words of Iain Thomas. My initial “Google” showed they were words from Kurt Vonnegut which caused my head to spin. That seemed a little out of character even with my limited knowledge of Kurt Vonnegut . . . so I dug a little deeper. 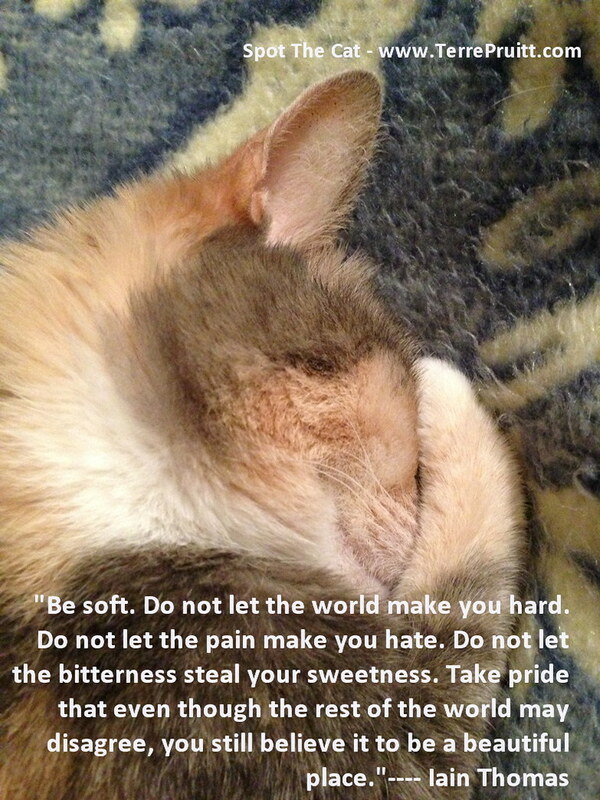 I mean, one more “Google” and I found something that said “Be soft is NOT Kurt Vonnegut but Iain Thomas”. A search of Mr. Thomas showed it was him. So thank you Iain Thomas for saying something that resonates with so many. Thank you for being so kind about how we just post your words about. I first read your words when my mom was sick or dying and so they meant a lot. And now that I am dealing with her death they are even more important. I will strive to stay soft, especially when there is such a strong push for women to be hard. I will work to not let the world make me so. I will strive to not let pain be a catalyst for hate. And I will continue to struggle against bitterness stealing my sweetness. And I will stand tall and recognize the beauty of the world even when others try to dictate how I should feel, how I should act, and what I should see. Thank you, Mr. Thomas. I will strive to your quote. Does this quote speak to you? What do you think about it? Often times I want the applications on my devices to do something they don’t do. When I remember that there is probably someone else who wants that too and I go look for it, I usually find it. 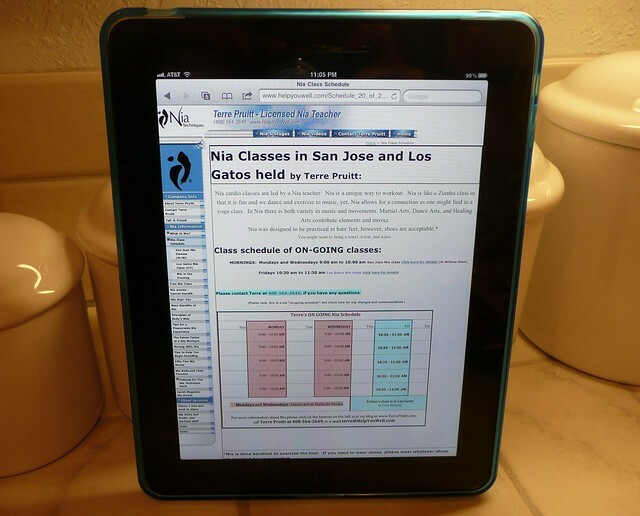 Recently I wanted a calendar with different functionality than the calendar that is part of the iPad. I also saw a commercial where they had a camera that takes pictures when you tell it to. So I went looking in the iTunes store and found two applications that I like. The iPad has a calendar program built into it. I like it because it allows you to set appointments/events/reminders. You can even set an alarm to remind you. You can also type in things as events or appointments and have them “recur”, ya know standard electronic calendar stuff. I wanted to be able to easily mark something, as I would on a paper calendar. I wanted to just make a check or a mark. I didn’t want to have to go in and create an appointment/event. Especially since I found myself splitting the thing I was marking down. Let me explain. This past month I had a Multiple Planks In A Day Challenge going on. The idea was to do three planks a day. Sometimes I would do all three at once, but sometimes I would split them up. So I might get up in the morning and do one. Then have to go teach a Nia class and come back later that day and do the remaining two. I wanted a calendar I could just mark a “1” on. Then when I completed my three I could either change the one to a three or a check mark. I found “A 2013 Planner” by Unidocs. It is pretty cool. I haven’t even really begun to use all that it does. For now I was just making Xs, checks, and numbers on it. But a glimpse at the other features makes me think it is pretty useful. You can write on it or you can type text on it. You can view it as an annual planner, a monthly planner, weekly planner, or a daily planner. 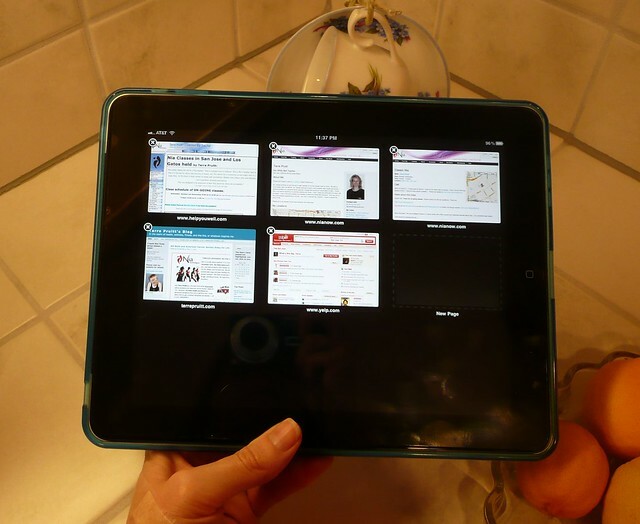 It really is like an appointment book planner, but on the iPad. You can also include pictures in it if you would like. It seems as if it can pretty much document anything. I was just excited to find an app that I could easily notate on the calendar like a real calendar. As I learn more about it, I can always share. On to app two: There is a commercial, I don’t even know what the commercial is for. There are so many commercials like that now-a-days they are so busy being artsy I miss what the product is that they are actually advertising. But in it there is a guy that says, “Shoot!” and his camera takes a picture. So I thought, “There HAS to be an app for that!” And there is. It is called Vapp. And it is nice because you set the sensitivity of the voice response. So if you are in a heavy metal concert you set the sensitivity to HIGH so it won’t go off with every noise. Then if you are in a quiet setting you set it at a low sensitivity so that if you just whisper it will take a picture. So you can use this when you are trying to take a picture of yourself in a group or if you need to take a picture hands free. 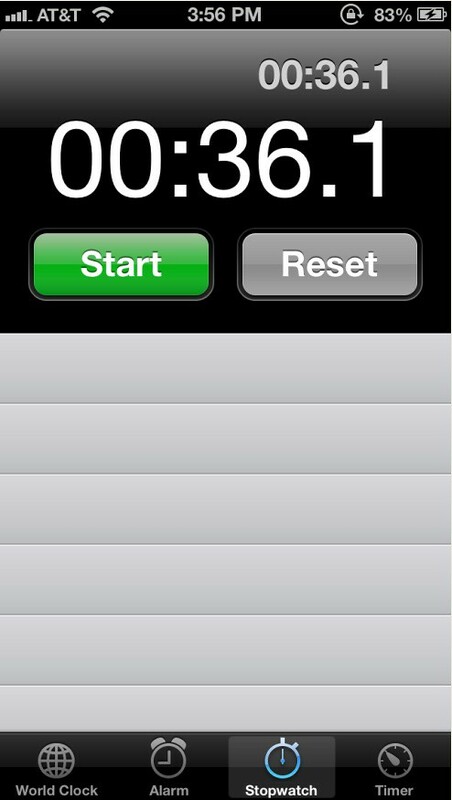 It also has a timer, which times AFTER you tell it to take a picture. It is pretty cool. Since there are so many applications out there it is pretty easy to find ones that do what you want for free. I think I have only purchased two or three applications. This is also the last day of the Multiple Planks In A Day Challenge. 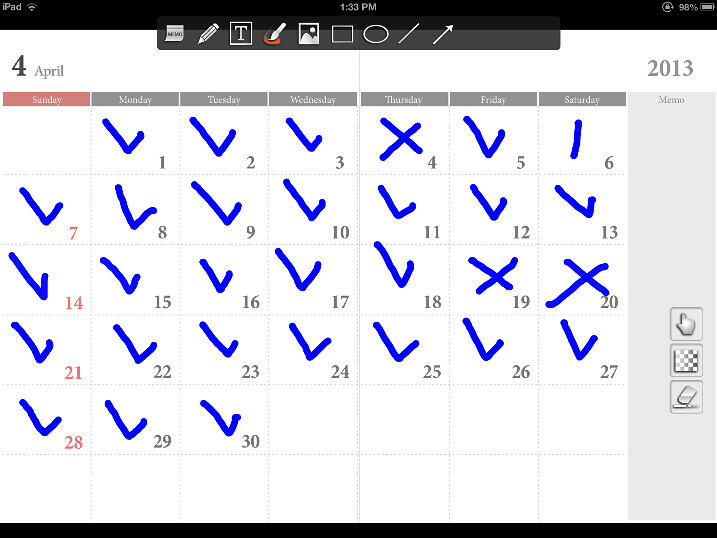 As you can see by my planner, I missed a few days (the BIG X) and on one day I only managed to do one. But I am satisfied with what I did. Sometimes you start something, like a challenge, and things come up and then it really becomes a challenge to keep on doing what you started. But then it feels good when you get it done. There are a lot of challenges out there and there are a lot of applications. I like to share when I find ones that I think are cool. Do you ever want the easy of a quick check mark on your calendar? Don’t you think that having a voice activated camera is cool? Do you have any applications that you would like to share? I love the list of 25 clever ideas to make life easier. So amazing. Some of the ideas I have seen before, some of them were new to me. The are all pretty awesome. I love the straw and strawberry idea. Kind of funny using a straw to “pit” a strawberry. Saves you from having to buy a tool for it. Someone try the walnut on the wood and tell me if it REALLY works. And for how long? I mean I am thinking that it is just the oil from the walnut that moisturizes the wood so the scratch is concealed. I bet you could use any oil to do that. Regarding the TV, I guess if you HAVE to get crayon marks off a TV or computer screen you would be desperate enough to try WD-40. Otherwise no way. I can’t imagine putting WD-40 on a monitor. I do know how to get crayon or wax off the carpet. It might even work for other fabric. Use an iron and a paper bag or any type of rough paper. Put the paper bag over the crayon/wax and then run the hot iron over it. The heat from the iron melts the crayon/wax and the paper absorbs it. If it is a lot of crayon/wax it is not a quick fix, but it works. I had a melted candle spill onto carpet once and I was able to get it all up with this method. But it took me a couple of weeks. I didn’t sit there for long, long periods of time. I would probably do a bag at a time. Eventually it all came up. I love the apple idea. I can’t wait to try that. Seems like that would work. The old, “put lemon (or citrus) on it” doesn’t work for me because it DOES leave a lemon taste. I don’t care for my apples to taste like lemon. Wouldn’t it be fabulous to pull out a pillow case full of the entire sheet set? I like that idea, but my hubby does do the sheets like shown here and he gets them completely flat. I have mentioned before how I can’t tell the difference between the flat sheet and the fitted sheet. The bowl does kind of help the volume of the iPhone. But you may know I have a little blue speaker, so I don’t need a bowl. Ingenious use of a wet-wipe container–storing plastic bags in it, but I just use a plastic bag to store my plastic bags and it works pretty good too! I really want to hear from you to know if some of these things really work. Can you really get sand off your skin by using baby powder? Then how do you get the baby powder off? Sand? Or water? Which you could have just used to get the sand off in the first place, right? I would imagine that putting a velcro strip on the wall could help store a lot of things besides just soft toys in a child’s room. Ok, I LOVE the wrapping paper idea. It is pretty smart to use the ceiling of a closet to store wrapping paper, but my closet ceilings are REALLY high. I actually have a wrapping paper holder that hangs in my closet. I have heard of using a nylon over a vacuum cleaner hose to find stuff. GREAT idea! I recently heard of cutting Xs in a shirt box to make a cupcake holder. Another GREAT idea. I love the magnetic strip for storing bobby pins, but I honestly didn’t realize that other people used bobby pins any longer. Shoes in a shower cap. Great idea. I use plastic bags. The ones that the newspaper come in. Or ones that might be around certain product you buy. Plastic cups in a muffin tin held in place by a magnet as a craft caddy . . . . dare I say it? That is pretty crafty! Love the use of bread bag closure things as power cord labels. That is smart. But my bread comes with wire twists. I have seen the ice cream cone cup cake thing before. Have you ever tried that? I have a friend that told me about popcorn in a regular paper bag in the microwave. However I don’t buy paper bags and I have never wanted to put my food in one that I might have gotten from a store purchase. A tension rod to hold spray bottles is a nice idea, but my cupboards aren’t that tall. Are yours? Mine could have hanging bottles AND stuff on the “floor”. If I made hard boiled eggs, I would so try making them heart shaped. But I don’t. I also don’t have such fancy muffin tins. But I bet it would work with regular muffins tins. Aloe Vera in ice cube trays. Oh my. Will someone remind me of this when I get a sunburn? This is GREAT. Think of how wonderful that would feel. I hear angels singing. Gutters as planters. Nice idea. And it is brilliant to use egg cartons to hold ornaments. Fantastic! So that is my take on the list. What about you? Have you tried any of these ideas before? Are you going to? I really want to know about the walnut and how long that lasts. When we first got our iPhones, they had a few issues or kinks, whatever you call them it would often not work properly. My husband being familiar with Macs figured out how to “Flash” the phone. He said it resets the parameter random access memory. This is the memory that is stored which allows the for quick start-up. Since my iPhone frequently went squirrelly back then, I got really used to doing it. I would do it probably at least once a week without being prompted. Then with one of the updates it went away. It either went away and then came back with another update or it changed. I actually think it went away, then came back different. The way the device responded when flashed was different so it seemed as if it was not going to actually do it. Whatever the actual case was, I got out of the habit. Plus the phone stopped being so buggy. So not only did it change so I thought the option of Flashing wasn’t there, I didn’t need to do it that often. So I forget that I can do it and sometimes need to do it. Have you ever worked for a company that has an IT department? When you have a computer issue what is the first thing the IT department asks you to do or ask you if you did it? “Turn it off then turn it back on.” Right? And then even once you do that, if they have to come to your work area to work on the computer that is the first thing they will do again. So we are all used to turning electronics off than on again, right? That is the FIRST thing we do. Well, flashing it is not quite turning it off and then turning it on. It resets the PRAM. Yesterday I wanted to listen to the music for a Nia routine for class, I plugged my little iHome Speaker into my iPad and it didn’t work. I rolled my eyes and thought, “Well so much for that.” I got my iPhone to see if the speaker worked with that. It did. So I plugged my earbuds into the iPad to see if they worked. They didn’t. So I just figured I broke it somehow. I mentioned it to my hubby when he was on his way home from work and he said, “Did you flash it?” I felt so silly for not having done it that I said, “Well, of course I did because that is always the first thing you ask.” And then I went on to say that I didn’t and I hung my head like a scolded puppy. Not too long ago another Nia Teacher and I were practicing Nia in a local park. She had brought her laptop so that we could look at the DVD and practice the routine. As you might realize it is very difficult to see a laptop screen outside when you are not right in front of it. We were dancing to the DVD, so we were not right in front of it. She also brought a long a little round speaker. She hooked it up to her laptop to help boost the sound. When we finally gave up on the laptop she plugged the speaker into my iPhone. Cool. It was round and had pretty good sound. It had a little leather looking case and was it just so cute. Of course, I wanted one. It is perfect to carry around “just in case”. 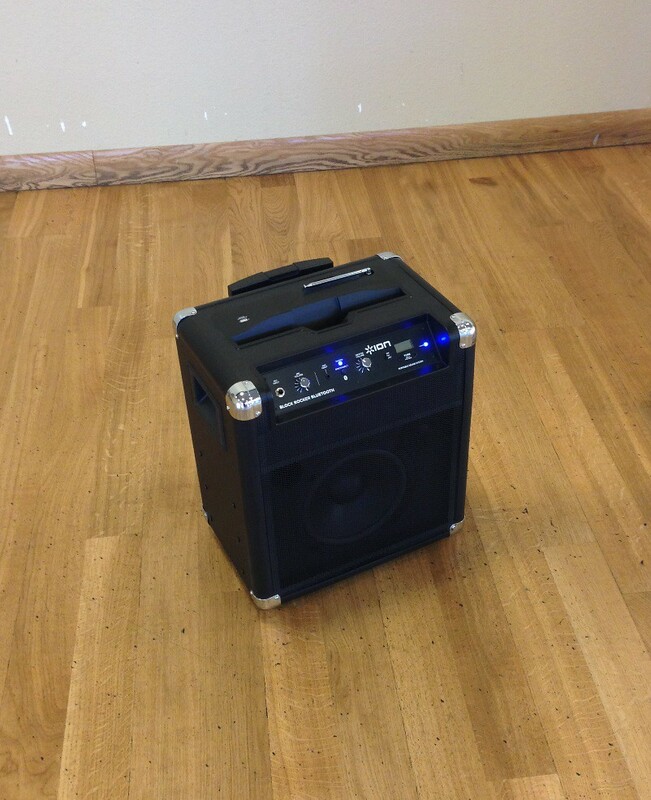 I pretty much always have my iPhone because I have my music on it, but not everyplace I have taught has a sound system so a little round speaker would be GREAT! It could fit in my purse. So to Amazon I went. I am the type that looks at something online for a little while before I decide to buy it. I have a house FULL of stuff. I do not need anymore stuff. I am a stuff collector. So I tend to hesitate before I buy more stuff. 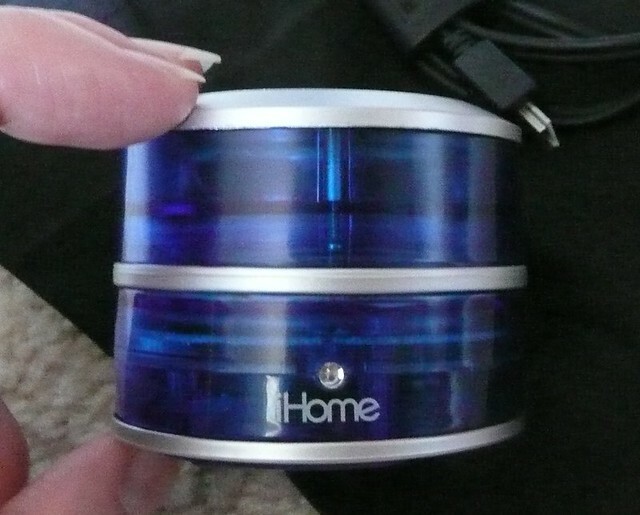 When I looked online I was seeing a little round speaker for more money than I need to spend on stuff I don’t need. 😉 Right? I mean, when I am buying something I can live without I tend to have a limit as to how much I will spend. So I looked around on the website. I was finding some nice speakers. I read some reviews. I looked here and there. When I always find myself thinking about the item for a while, I usually give in. And I am so glad I did. It is so cute. And the sound is pretty good for the price and what it is. The sound is WAY better than the sound that comes out of the iPhone. 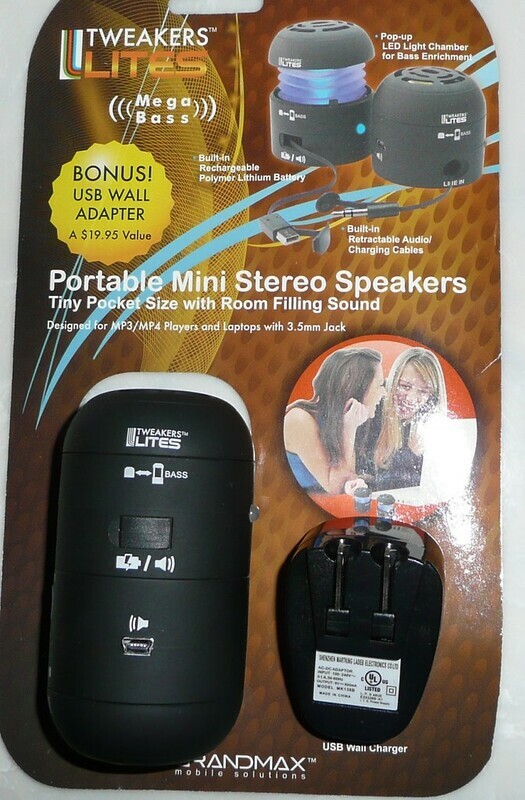 A mini-speaker. Yay! Does it give GREAT sound? No. Is it stereo? No. But it give really good sound and I can hear the music much better than on my iPhone. 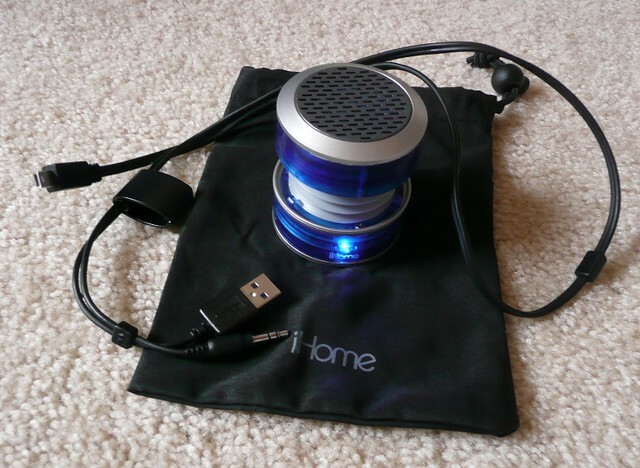 The description on Amazon says: “Speaker works with any 3.5 mm headphone jack, perfect for laptops, cell phones, portable game devices, MP3 players, etc.” So you can use it on all of your devices. It doesn’t come with a nice leather case like my friend’s but it does have its own little bag. That is good enough for me. I just like something that fits the device AND its cord. Something some people might like is that its audio cord does not come apart from its charging cord. I know we end up having so many cords that it is easy to misplace (or as my friend says, “Put away so well.”) some of the cords. When you have a cord to charge the device and a separate one to use it sometimes the power cord can get lost because you don’t use it as often. Well, these two cords do not come apart. 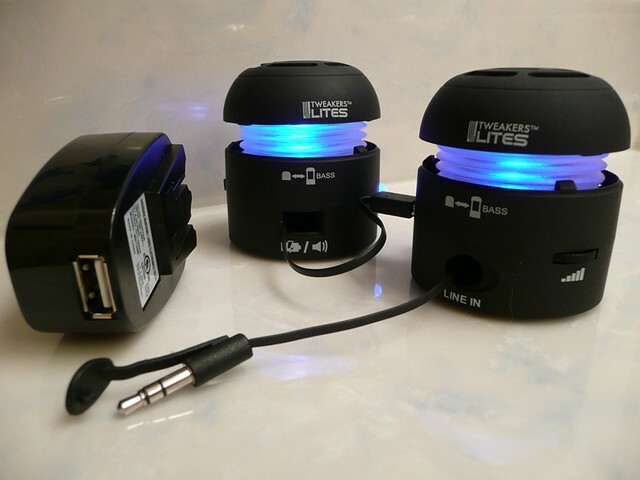 There is a little plastic separator that hold them together, it is the little square below the USB connector and the audio plug, and they are connected near the end too and become one cord. The cords also have a build in “clip” to keep them neat and tidy. In this picture it is to the left of the bag, the black plastic square. Cool. All built-in! Blue things make me happy. Blue things that are cute make me happy. Blue things that are cute that allow me to hear my Nia music and all music better make me really happy. And that it was less than $20 makes me so happy I want share! I had a lunch date after teaching my Nia class on Wednesday. I had mentioned, in a previous post that I wanted to cook more with fruit since we had a large amount of plums. So, I was happy to try the mango and chicken kabob. Obviously, I can’t take credit for cooking and/or preparing this. I did not cook this kabob. Worse, I took the picture with my iPhone so it is — well, the quality of an iPhone picture (it was actually so blurry I had to “sharpen” it with Photoshop). As the waiter was setting the plate down, I thought, “Oh, I need to take a picture.” But I forgot when the waiter brought another plate of kabobs that we did not order. I think he just didn’t want her to feel left out. I remember after I ate one! Anyway . . . .GREAT way to cook with fruit. I don’t think I would have thought to put mango on a skewer with chicken, but it actually works perfect because it cooks great. I have determined a long time ago that it is too difficult to cook meat and veggies on the same skewer because in order to get the meat cooked properly the veggies get too done. Or vice-versa, depending on the meat and the veggies. So it is best–for us–to do them separate. Plus separate allows for different seasonings and it keeps the meat separate from the vegetables in case there are persons who are not eating meat. The mangos were cooked with the skin on and for the most part that made the skin very edible. I didn’t even notice the skin until I got to a particularly tough one that was green. So, yay! A way to cook with fruit AND another way to use mangos. I normally only use them in the cucumber mango salad. I would have thought to make a salsa, but not to put them on a skewer especially WITH the chicken. 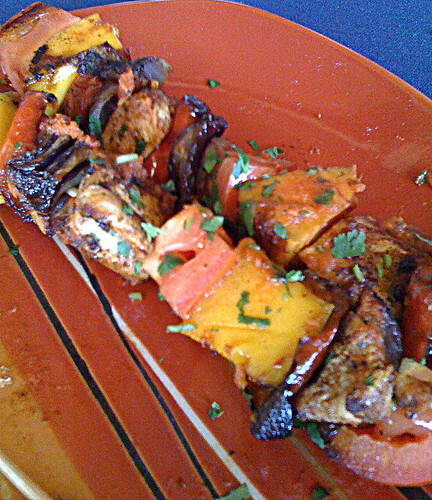 You might have noticed that this kabob has onions, red peppers, and tomatoes too. I even ate the tomatoes (big deal for loath-tomatoes-girl), even though they were cooked. Do you cook with mangos? Do you make kabobs? Kabobs are a nice way to serve food for a cook out, huh? Have you managed to perfect cooking vegetables AND meat on the same skewer?